Microprocessors were expensive forty years ago. Popular processors such as the Intel 8080 and Motorola 6800 would sell for hundreds of dollars, and these high prices were a significant barrier to the development of low-cost personal computers. A group of engineers from Motorola, including the pioneering Chuck Peddle had tried to develop a simple low-cost device while at Motorola, but had been rebuffed. 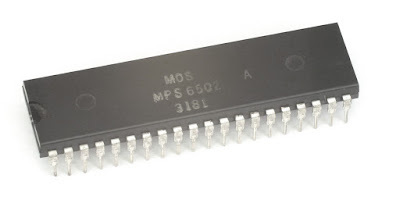 Instead, they left the company to join a small firm called MOS Technology, and they set upon developing the MOS Technology 6502 processor instead. The design philosophy of the 6502 could be summed up in about three words: “keep it simple”. Instead of loading the processor down with extra features, Peddle and his team created a processor that was much less complex than rivals. This meant that it was much cheaper than rivals. And it also meant that it was much faster. A simpler design was cheaper, because the actual silicon part of the chip was smaller, and this led to fewer flaws during manufacturing and also increased the number of chips that could be produced on one wafer. The result of this was that MOS Technology could sell the 6502 for just $25, a fraction of what rivals were charging. At this price point, the 6502 became an obvious choice for the many of the microcomputers that emerged in the late 1970s and early 1980s, including the Apple II, Commodore PET and VIC-20, Acorn Atom, BBC Micro and Electron, Atari 400 and 800 plus a variety of lesser-known or now-forgotten computers plus a wide range of embedded systems. MOS Technology was eventually taken over by Commodore in 1976 and spun out into a separate company again in 1995, although that company was eventually liquidated in 2001. You might think that an 8-bit processor from the 1970s has very little influence today, but there is a surprising twist to the tale. When the engineers at Acorn in the UK were designing their range of 6502-based computers, they were impressed by the simplicity and speed of the 6502 design. This directly influenced the development of the Acorn ARM processor that was used in their Archimedes computer in the 1980s. So successful was the ARM design, that variants of that processor are now used in millions of devices today. The smartphone or tablet you own today is probably based on an ARM core, which is directly influenced by this 40 year old device.